The much publicised policy to regularise encroachments on government land has virtually proved to be a trap for those who have illegally occupied forest land and applied for its regularisation. Succumbing to the increasing pressure due to continuing strike both by the employees members of the entre managing committee of GGDSD College, Baijnath, headed by former Palampur BJP MLA, Dr Shiv Kumar resigned on Saturday. Students belonging to the Scheduled Castes and Scheduled Tribes living in the district have been refused admission in Jawahar Navodaya Vidyalaya at Pandoh in Mandi district. This was alleged by Mr Chhaju Ram, vice-president of the district Scheduled Castes and Scheduled Tribes Cell of the Congress, in a press note here today. Efforts to promote dry land farming under the Indo-German Changer project has brought prosperity to people of arid and infertile hills of Kangra district. Launched in 1994 the Rs 50 crore project has changed the socio-economic status of the people. Even as this hill resort has become a big draw among tourists, mostly domestic, in the past decade it some how lacks basic amenities. The Tibetan spiritual leader Dalai Lama will hold meetings with top spiritual leaders from various Buddhist sects and renowned scientists from the world over. The five-day discussions will commence at the residence of Dalai Lama from tomorrow. According to sources, these discussions are being held at the behest of Dalai Lama who had established an institute — Life and Mind Institute — about 15 years ago. Life is tough for those living in the isolated Taragarh and Behi-ka-Bagh belt of Bhattiyat sub-division in Chamba district due to the absence of proper roads, lack of transport facilities and agricultural development. The delay in the construction of a small bridge over Salasi nullah on the Hamirpur-Dharamsala highway near Salasi village has posed various problems not only to the locals but also to people travelling by this road. While their encroachments will not be regularised in any eventuality, given the stringent provisions of the Forest Conservation Act, they stand to lose the facility of free trees to which the right holders are entitled to under the timber distribution rules. The Forest Department has already initiated action in the matter and the Principal Chief Conservator of Forests has written to all divisional forest officers to maintain a proper record of those who have applied for the regularisation of encroachment on forestland and ensure that they were not sanctioned trees under the timber distribution rules. Under the forest regulations, anyone who has committed an offence under the Forest Act can be denied the facility of free timber. Encroachment of forest land is one of the serious offences along with illegal felling of trees which attracts this penalty. The Supreme Court has been closely monitoring the implementation of the Forest Conservation Act, which debars states from diverting forest land to non-forestry use without the prior approval of the Centre, ever since some environmentalists filed a public interest litigation to put a check on felling of trees. There is, thus , no possibility of regularisation of encroachments on forest land. However, thousands of encroachers were taken in by the hype created by the government on the policy, tailored to woo the electorate in the election year, and applied for regularisation. In fact, there has been a spurt in encroachments ever since the policy was announced and in some cases it even led to dispute in villages. The Forest Department all these years had failed to prepare an authentic record of encroachments and the regularisation exercise has come in handy in this regard. It is now aware of thousands of encroachments, which never figured in its records. In all there are over 9000 cases of encroachments involving about 18,000 hectare of forestland. By applying for regularisation they have themselves admitted this fact. Thus, the Forest Department does not have to conduct any inquiry to establish this fact and it could take action straight away. Denial of free trees to offenders will help save precious but fast dwindling forest reserves. At present about 1.25 lakh cubic metres of standing volume of trees is allotted to right holders under the rules, virtually free of cost. For instance during 1994-1999 period over 2.10 lakh free trees, worth over Rs 275 crore were given for a meagre amount of Rs 2.13 lakh. As against the average market rate of Rs 5,000 per cubic metre, the right holders got it just for 37 paise per cubic metre. Officers of the department maintain that it would not be possible to check encroachments so long as the politician continued to come out with regularisation policies to secure the votes of offenders. Political will was required to enforce the rule of law by taking stringent action against the offenders. According to sources, the managing committee was to hold its meeting in the college premises but foreseeing unsavoury protest by students and employees, the venue was shifted to hostel building. However students, teachers and employees converged there and raised anti-management slogans demanding the resignation of the Principal. The meeting, chaired by Dr Shiv Kumar was also attended by BJP MLA and party District unit president, Mr Dulo Ram, the SDM, Baijnath and other members of the managing committee. The situation turned ugly when slogan-shouting students gheraoed the members and barged into the meeting demanding the sacking of the Principal Dr D.C.Parashar. According to insiders, there were acrimonious arguments between the Chairman and other members. When no accord was arrived, in a sudden move, Dr Shiv Kumar declared that as the situation was beyond the control of the management, they should submit their resignation. Despite protests from the SDM Mr. S.L.Saini and Mr Dulo Ram, a resolution to this effect was drafted and signed by other members and was forwarded to the state government. A request for the government take over of the college had also been made. Meanwhile, the agitation launched by the students and employees continues. According the agitators, unless the Principal Dr D.C. Parashar is removed, they will continue the agitation. Students belonging to the Scheduled Castes and Scheduled Tribes living in the district have been refused admission in Jawahar Navodaya Vidyalaya at Pandoh in Mandi district. This was alleged by Mr Chhaju Ram, vice-president of the district Scheduled Castes and Scheduled Tribes Cell of the Congress, in a press note here today. Mr Chhaju Ram said the Principal of the school did not even issue forms to the students on the pretext that Kulu students could not be given admission because a separate school had been allocated to the district and 14 bighas land had been allotted at Mohal, near Angora Farm. Mr Chhaju Ram said the land might have been allocated but the school was not running, then how come the children belonging to the district and the adjoining tribal district of Lahaul and Spiti were refused admission at Pandoh. Efforts to promote dry land farming under the Indo-German Changer project has brought prosperity to people of arid and infertile hills of Kangra district. Launched in 1994 the Rs 50 crore project has changed the socio-economic status of the people. Rupees 20 crore was spent in the first phase, It was completed in 1998. The implementation of Rs 30 crore second phase is under way. The project is stated for completion in 2004. The project, spread over 439 square kilometres covers 593 villages of Baijnath, Jaisinghpur and Palampur tehsils. The prime objective of the project is to improve farm yield and popularise the use of renewable natural resources through intra-disciplinary measures with focus on the conservation of soil and water, animal husbandry and forest management. It also aims at strengthening the self-help organisations at the village-level. The project is likely to give new dimension to the conventional watershed approach by placing the people at the centre of development. This would help not only in improving the management of existing land but also help convert the arid land into productive fields. An integrated resource management plan has been formulated for every village and the Local Development Committees have been formed for proper implementation of the scheme. The concept of the Village Development Committee aims at ensuring maximum participation of local people, particularly women in the development process. As many as 50 per cent seats have been reserved for women in the Village Development Committees. Afforestation of barren hills is a major activity under the project. Plantations have been raised over 2658 hectares of land so far. In addition 1.09 lakh saplings of fruit plants have been distributed among the people. As many as 494 community tanks, wells and 318 personal tanks have been constructed in the area for drinking water needs and irrigation. Repair of 472 water tanks was also carried out and all these were made functional. Special stress has also been laid on providing better medical facilities and adequate fodder for the cattle. An innovative scheme, has been introduced for the health of the cattle under which farmers have to deposit Rs 10 only with the Village Development Committee. It sends the list of sick animals to the project officers, who in turn, depute a team of veterinary doctors to treat the animals. Efforts are on to conserve the fragile Shivalik ecology by involving educational institutions in environmental conservation. The students are provided saplings for planting these on private, community and government land. The project has been bringing about a silent socio-economic revolution in the area. Even as this hill resort has become a big draw among tourists, mostly domestic, in the past decade it some how lacks basic amenities. They have not improved despite repeated pleas by the Barog panchayat to the authorities concerned in this regard. 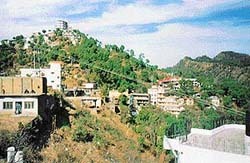 So much so when the Special Area Development Authority, Barog, was formed under the Town and Country Planning Act mainly to regularise the construction along the Kalka-Shimla national highway, it was planned to make Barog a more beautiful and cleaner place, yet nothing of the kind has happened. On every weekend the main market here remains jam-packed with the rush of the tourists but in adequate drinking availability reduces the commercial viability of the place. According to local dhaba owners and shopkeepers they often have to face difficult situations for want of sufficient potable water to meet the requirement of tourists and run their business smoothly. The situation worsens in summer, the peak tourist season, when water supply is available only for an hour or so. During summer water supply is disconnected to private connections for days together. Besides, tourists as well as people from the surrounding areas who come here to catch buses have to face great inconvenience as this famous tourist destination has no public toilet. About a year ago the district administration had started the construction of a public toilet on government land along the highway. The toilet was almost completed when work had to be suspended following objections by a hotel owner due to close proximity of the toilet. Till date the Barog panchayat and district administration have failed to choose an alternative site for the toilet. However, a signboard put up by the panchayat near the bus stand still stands indicating the toilet. Recently, Mr Sanjay Kumar, vice-president of the Barog panchayat, wrote to the DC, Solan, in this regard. For lack of proper guidelines the hill side is virtually littered with garbage and polythene bags. The tourists as well as locals are equally responsible for creating such a situation. Recently, taking serious note of the problem, the Barog panchayat has formed a market committee who would look after the proper management of waste material. Under the new arrangements it has been made mandatory for all shopkeepers to contribute a monthly fee to facilitate proper dumping of the waste. Those will face action from the panchayat who do not cooperate in this campaign to curb the menace. The pictursque Barog railway station is known for its enchanting beauty but there is no proper path leading to the station from the Barog market. If constructed, a road to the station can considerably enhance commercial activities in the area locals. The Tibetan spiritual leader Dalai Lama will hold meetings with top spiritual leaders from various Buddhist sects and renowned scientists from the world over. The five-day discussions will commence at the residence of Dalai Lama from tomorrow. According to sources, these discussions are being held at the behest of Dalai Lama who had established an institute — Life and Mind Institute — about 15 years ago. The main objective of this institute is to coordinate the discussions between scientists and spiritual leaders of various Buddhist sects on subjects which can benefit the humanity at large and Buddhists in particular. The main topic of discussion this year will be: “What is matter – What is life”. While Dalai Lama will chair the discussions, about 15 senior lamas and scientists from different fields will take part in these deliberations, about 50 senior Buddhist spiritual leaders and scientists will be present as observers. Apart from the Head of the Genome Research Centre at MIT, winner of Nobel prize in Physics in 1997 Dr Steven Chu are in Dharamsala to participate in the five-day deliberations. 17th Karmapa Ogyen Trinlay Dorjee will also participate in the deliberations as an observer. The education scenario is no better for there is only one middle school in the entire area. Even for medical aid, they just have one government dispensary. The residents of this belt allege that politicians from various parties visit this pocket only to woo the people before elections, but are not to be seen once the elections get over. This isolated belt is situated at a distance of about 95 km from the district headquarter town of Chamba and about 25 km from Nurpur township, the tehsil headquarters of Kangra district. The geological formation of this belt is also such that the entire area is undulating and fragile. Even during a spell of rain landslides occur and often wash away pieces of cultivable land. It also poses danger to their houses at several vulnerable points. The belt remains cut off during the rainy season owing to flash floods in the Lahroo khud and its tributary nullahas and the residents of this belt have to cross the flooded rivulet to reach their homes. The construction work of the bridge was started about six months ago after dismantling the existing bridge. A new bypass was also constructed for the safe passage of traffic. However, the tough gradient towards Jhaniari from Salasi has led to road blockades almost daily. Vehicles loaded with cement and heavy goods are always found parked in the middle of the road due to various mechanical and technical faults and it takes hours together to clear the traffic. A spokesman for the Public Works Department said the contractor had been asked to complete the construction work of the bridge on a warfooting so that there were no more road blockades on this road. Traffic on the bypass is causing inconvenience to the children whose school is located here. Kail (Pinus Wallichiana) trees in the Tutikandi belt in Shimla forest range have started drying up. The needles have turned brown. The Himalayan Forest Research Institute, Panthaghati, found frasses coming out of holes in the stems. This disease has been caused by fityogenes-scitus. The beetle is sub-elongate, black shining in colour and about 2.75 mm in length. The research team has suggested enumeration of infested trees, cutting of climbers, removal of unhealthy trees and bushes.